around, you'll wonder why you haven't replaced your natural turf already. There really is no substitute for outdoor recreation, and laying an artificial grass lawn gives your children and pets somewhere safe, clean and fun to play. absorb the shock of a fall, meaning that any injury can be potentially more serious. 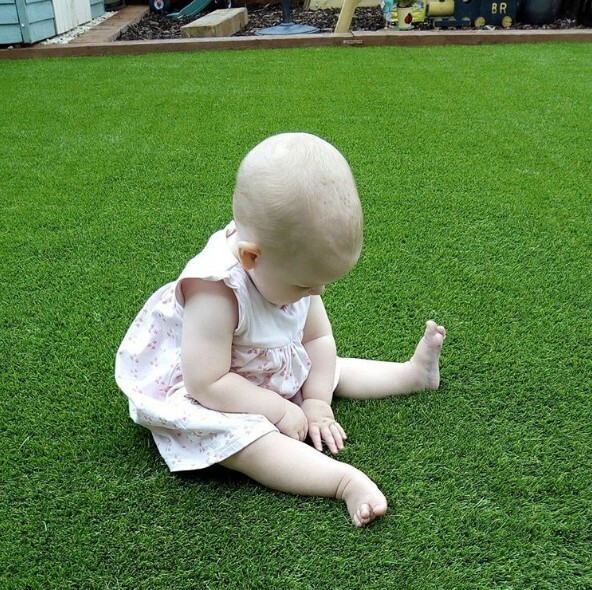 Artificial grass laid over a play mat system offers a soft and springy surface that can effortlessly absorb shocks and stop a fall resulting in a severe head injury. Your free draining artificial lawn won't get muddy or form puddles. That means you'll spend less time cleaning the house and washing grass stains and dirt out of your children's clothes and more time playing out in the garden with them in all weathers. And if your biggest bugbear is pet pawprints all over your clean house, artificial turf eliminates that problem too. durable and attractive surface for your children and pets to enjoy all year round. over the years and some lawns are now virtually indistinguishable from the real thing. That means you can enjoy the look and feel of a lush green space - and so can your pets and children.